I hope you're having a lovely day so far. We are having a fantastic morning....not! If I was to tell you that porridge is so hard to get out of your hair once dried you will know that I own a two year old!!!! The little monkey even managed to put some of the poor dogs back. So you could say that sitting down to meals is not something that we look forward to in the Combes household. 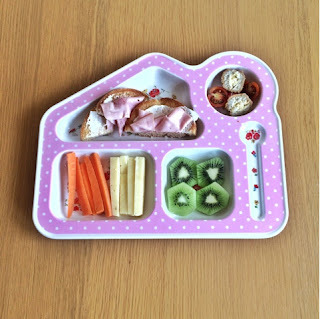 We have been really struggling with getting my daughter to eat her evening meal, I seem to waste so much time and effort for her to not even touch her food. Lunch: Ryvita Crackerbread with Cream Cheese, Carrot & Cucumber Sticks, Tuna, Sweetcorn with Cherry Tomato Halves. Dinner: Potato Wedges, Carrot & Green Bell Pepper Sticks, Fish Fingers, Chive with Onion Chutney Cheese and Cherry Tomato Halves. 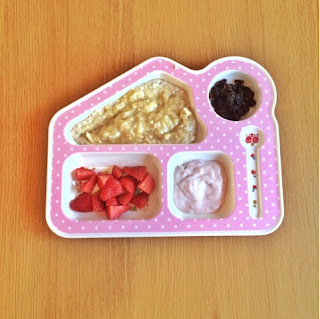 Breakfast: Porridge with Raisins, Apple Wedges, Grapes and Strawberries. Lunch: Dutch Crispbakes with Ham & Cream Cheese, Carrot Sticks, Cheese, Kiwi, Savoury Egg and Cherry Tomatoes. Breakfast: Banana Porridge, Strawberries, Raspberry Greek Yoghurt & Raisins. 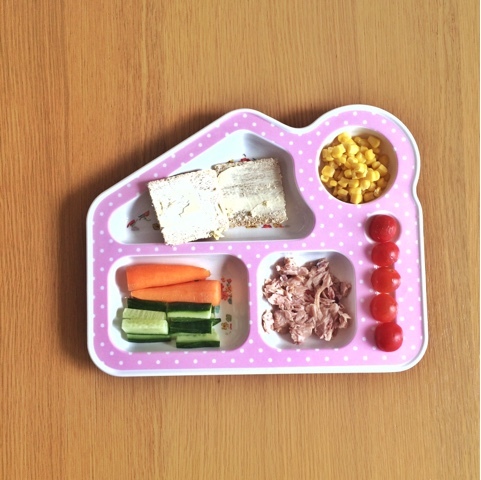 Lunch: Ryvita Cracker bread with Soft Cheese, Carrot & Cucumber Sticks, Tuna, Cherry Tomatoes and Sweetcorn. Lunch: Dutch Crispbakes with Cream Cheese, Cucumber Sticks, Cheese Chunks, Tomato Halves and Ham. 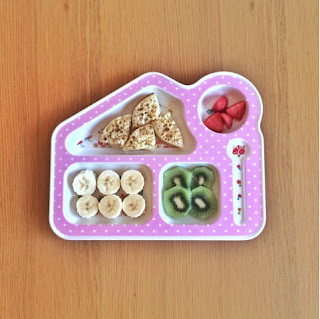 12 comments on "A Week of Toddler Meals"
What a pretty and delicious collection of meals... one lucky girl! I have a six year old and 10mth twins so at the moment I feel like I am making different food for everyone! Oh the day when we can all sit down together and eat the same food with no complaints!! Wow you definitely have you hands full lovely. 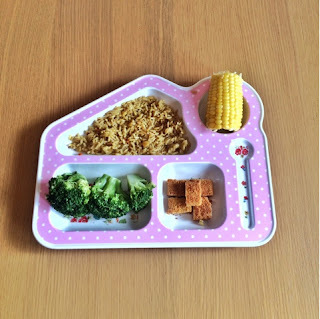 I loved when Amelia was weaned so we could all eat the same, so no batch cooking for me! 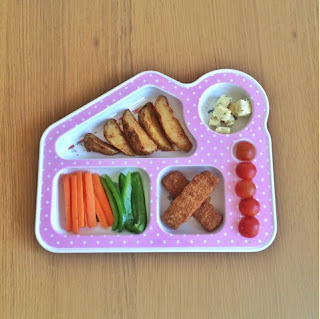 This is great, I'm always looking for meal inspiration for my eldest. The little plate is too cute! The plate is so cute and perfect for her portions! 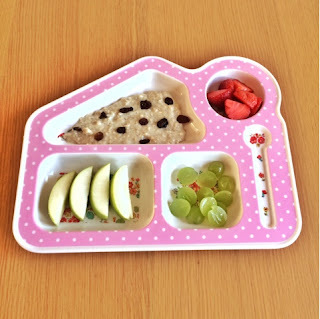 Sections plates are perfect for little ones! She will not eat meat though, no matter how hard I try!